Northwood Elementary School Principal Eric Barr, left, and Jeff Pollard, owner of Sidney Tire, look at the new sign Pollard had installed on the fence between the two properties. SIDNEY — When students headed out to recess at Northwood School, they noticed something new: what was previously an overgrown fence line is now a new fence with a black and yellow “Northwood” screen, and it was all thanks to Sidney Tire owner Jeff Pollard. Pollard had approached Northwood Elementary principal Eric Barr about the fence line, which rests on Sidney Tire property. He asked if Barr would mind if he cleaned up the fence line by pulling out all of the overgrown brush and trees and putting in a new fence. Barr was ecstatic, noting sometimes kids would go to retrieve balls from the brush and come out with poison ivy. Pollard had told Barr his plans to add a screen for privacy as he stores cars and equipment behind his shop and wondered if the school might like it to say something. The two decided it would be great if it said “Northwood” in Sidney yellow and Barr said the school would be willing to split the cost. The two joked about playground balls going over the fence. 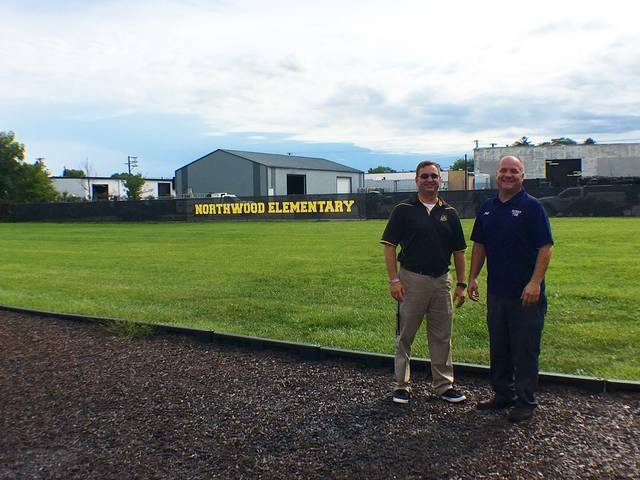 https://www.sidneydailynews.com/wp-content/uploads/sites/47/2018/08/web1_lookingatsign.jpgNorthwood Elementary School Principal Eric Barr, left, and Jeff Pollard, owner of Sidney Tire, look at the new sign Pollard had installed on the fence between the two properties.